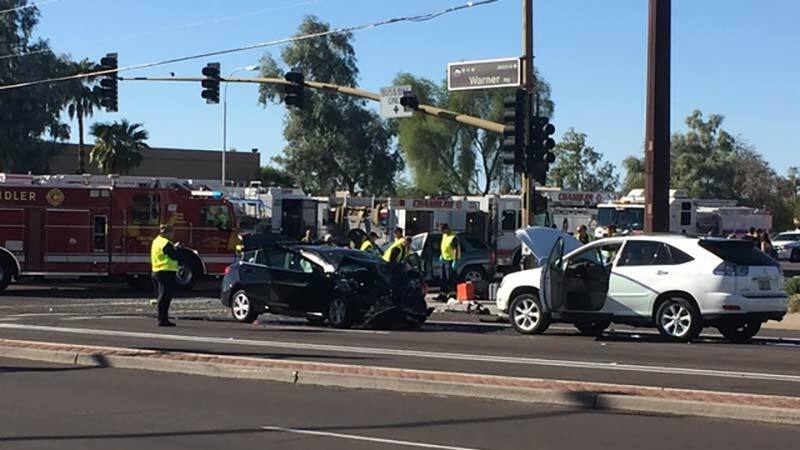 Chandler, Arizona—Ten people were injured when three vehicles collided Sunday afternoon near Arizona Avenue and Warner Road. According to a spokesperson for the Chandler Fire Department, one young girl is hospitalized in critical condition after she was ejected from the car in which she was a passenger. It took Chandler Police accident personnel almost six hours to clear the intersection following the crash. Accident investigators have not released the identities of those involved, nor any additional information, as they continue their search for the cause of the accident. We wish all those who were injured swift and complete recoveries.